Just got one of those press releases that makes me want to yell “stop the presses.” If only someone actually used presses any more? This news is perfectly timed to help those in need of securing the ideal holiday gift for the food-lover (more specifically gelato-lover) on their list. My friends have not stopped talking about that gelato, particularly the decadent, not-too-sweet burnt sugar, unlike any caramel you’ve ever tasted. Though she does offer a few classic offerings, such as gianduja and vanilla (albeit Organic Bourbon Vanilla), Holly is clearly having fun in the kitchen developing her flavors. Consider Pinenut Brittle with Marsala Currents, Toasted Rice, and Mascarpone with Honeyed Raspberries. And I have got to get my hands on some of her malt gelato. Special orders and home delivery have been available for a while now. But what’s new is the “gelato a month” club format–which they’re calling Gelato to You–that you can now offer as a gift to family and friends. From a 1-time delivery any single month, to monthly deliveries for a full year, each shipment will include 4 pints (different flavors, pending the season and Holly’s inspirations). Including delivery, the cost is $50 per month (in 3-month increments) for Seattle area, a bit more for farther destinations. Hopefully Santa’s listening in and may hear the whispers of gelato fans near and far who plan to add this to their Christmas list! Ok, it wasn’t really ice cream. It was amazing, rich, dense, creamy gelato that drew me downtown one early evening last week. My friend Maria Coassin, who opened Gelatiamo in 1996 (my how the time flies!) was celebrating a recent remodel of her small, bright space at the bustling corner of Third and Union in Seattle. 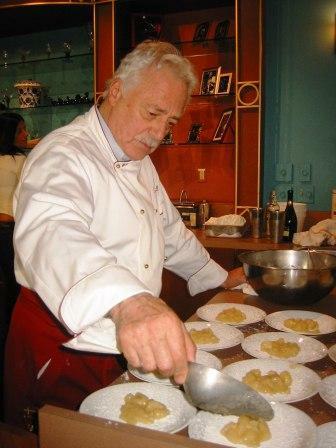 As a special guest for the festivities, her mentor in the art and craft of making gelato–Pino Scaringella–came from Italy to join Maria in the celebration. Her gelato case was a thing of beauty, as artful and jewel-like as any case we saw in Italy on our trip last year. I was trying desparately to not ruin my dinner later that evening at Dahlia Louge, but couldn’t resist sampling a few gelatos as an appetizer. I nibbled a couple longstanding favorites, coconut and frutti di bosco(mixed berry). But I also couldn’t resist trying the two flavors made exclusively for the celebration: gorgonzola and the limey-refreshing caipirinha. I loved the gorgonzola gelato enough to eat it unadorned. But Maestro Scaringella sauteed some pears as its accompaniment, which would make for a killer dessert to serve at a dinner party. In my case, it had to suffice as an amuse bouche before sprinting up the street for dinner. Get yourself downtown for a taste of Maria’s amazing gelato creations, if you haven’t yet indulged yourself in that delicious artisan product. 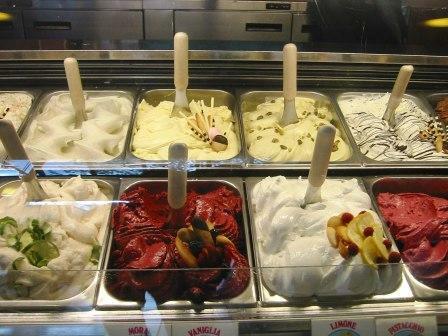 Or here’s a hint: next time you order a pizza from Pagliacci, add a pint of Gelatiamo gelato to your order. No more decadent way to cap off your AGOG primo than with a pint of primo ciaccolato!